As the popularity of virtual teams continues to rise, those who manage and are part of virtual teams must be aware of how to enhance the effectiveness of and foster creativity in virtual teams. 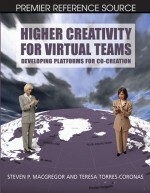 To provide assistance, this chapter presents a model that outlines five building blocks for enhancing and supporting creative work in virtual teams. The five building blocks are—design, climate, resources, norms and protocols, and continual assessment. By building and maintaining each of the five building blocks discussed in this chapter, virtual teams may move to higher levels of creativity and ultimately success. The chapter begins with a review of the relevant literature, including prominent models of virtual team performance, and factors necessary for creativity in teams in general. The second section in the chapter describes the methodology that guided the current research from which the five building blocks model emerged. The third section of the chapter offers a detailed description of each of the five building blocks for creativity in virtual teams. Lastly, an integrative model is proposed which links the five building blocks back to the earlier discussed models of virtual team performance. The chapter closes with a discussion of the current research’s limitations and ideas for future researchers of virtual team creativity.